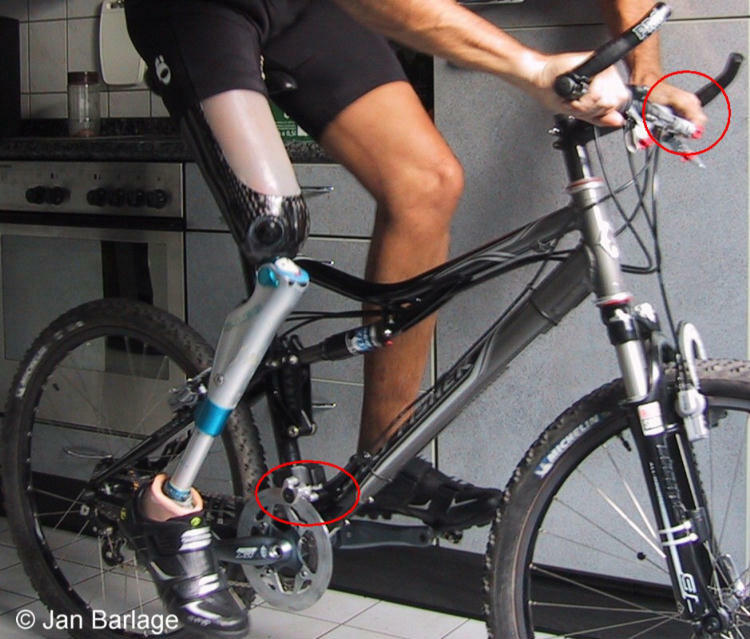 This page was created to provide information on prosthetic limb modifications for use in amputee mountain biking and cycling as well as other sports. 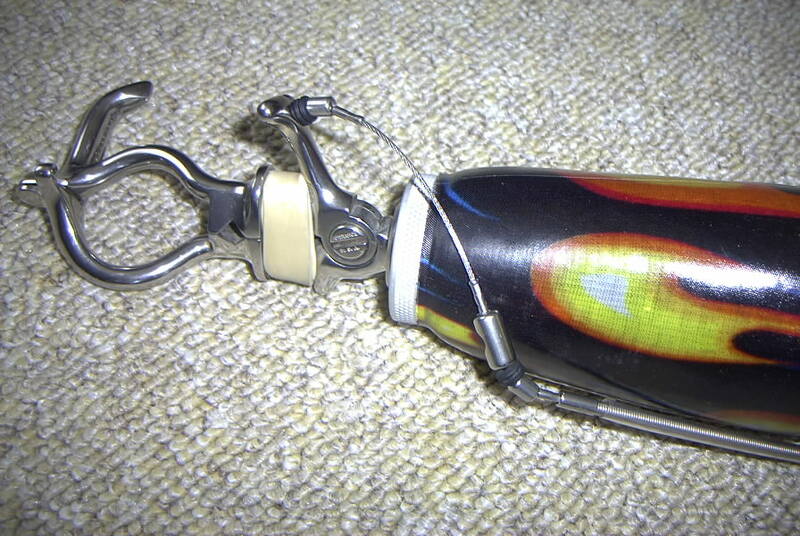 Included on this page are modified prosthetic arms, prosthetic legs, and prosthetic devices. 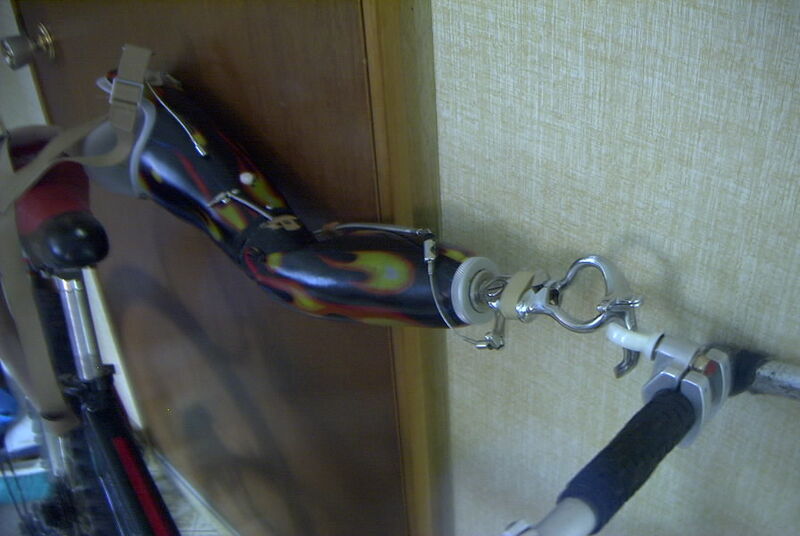 Prosthetic Arm Modifications for Bike Riding. 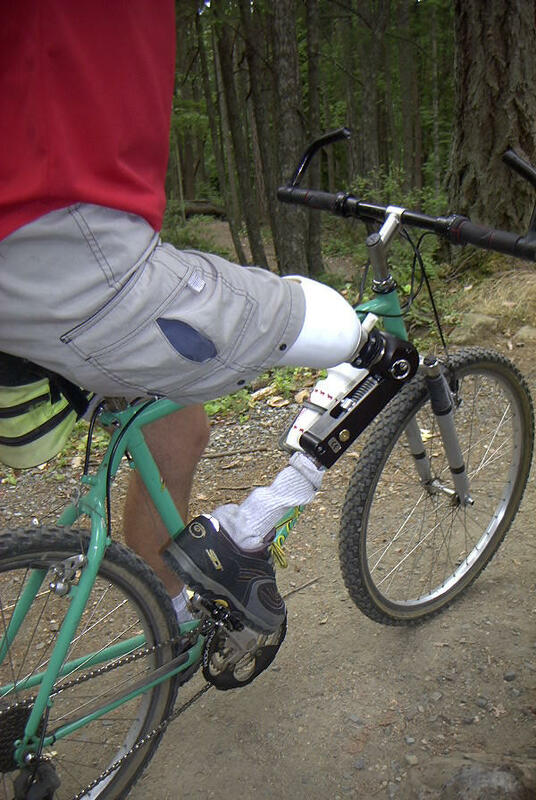 Prosthetic Leg Modifications for Bike Riding. 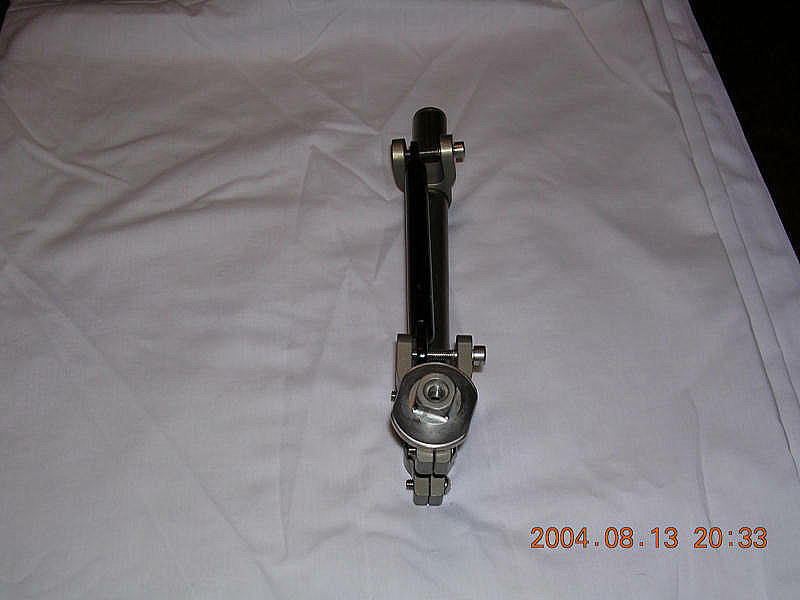 The following two pictures show the first & second generation dedicated riding arm. 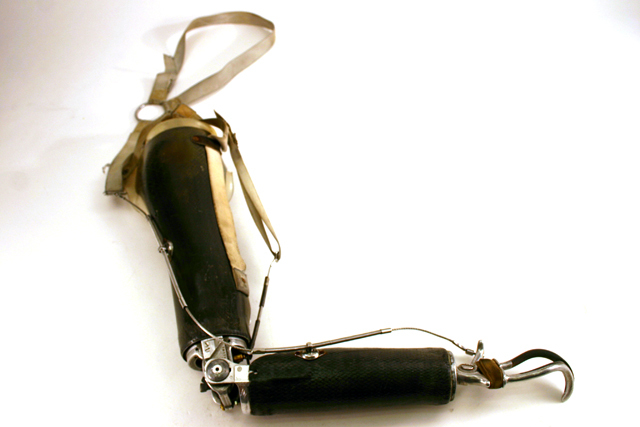 The top arm depicts the first generation arm. 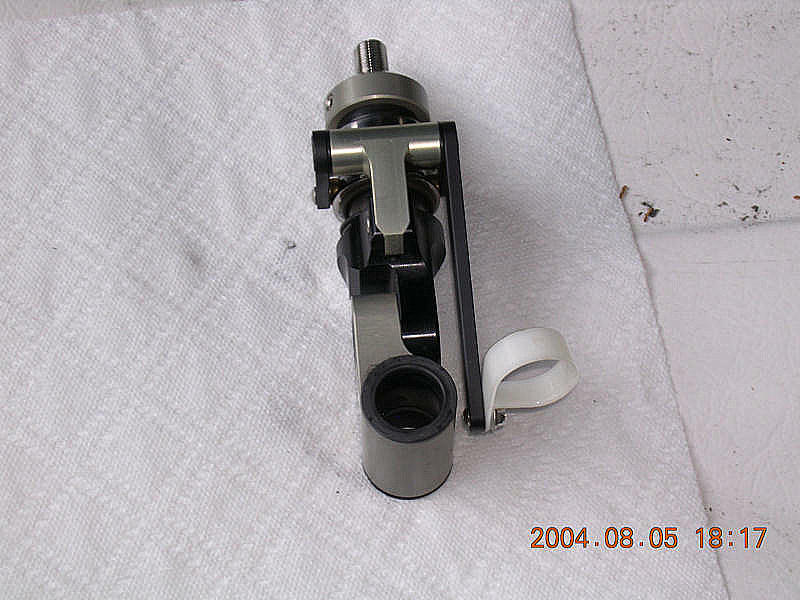 Both designs feature "Seattle Mind" socket mounting adaptors. 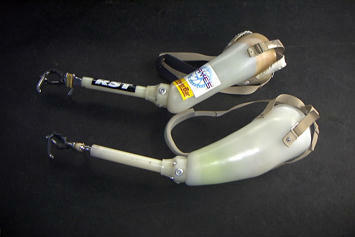 The adaptors are actually leg-knee components. 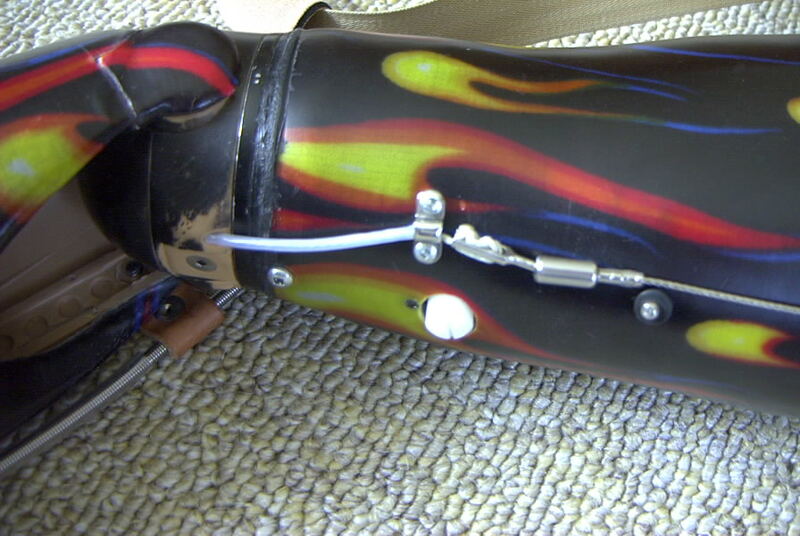 The adaptor is attached to the upper socket with screws, then secured with epoxy glue. 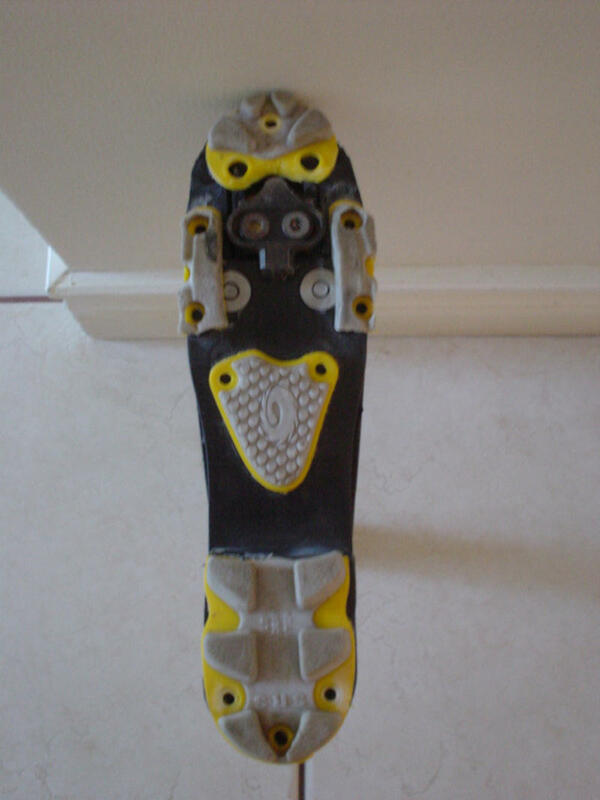 The upper sockets are simple clear plastic test socket material, that is properly fitted & moulded. 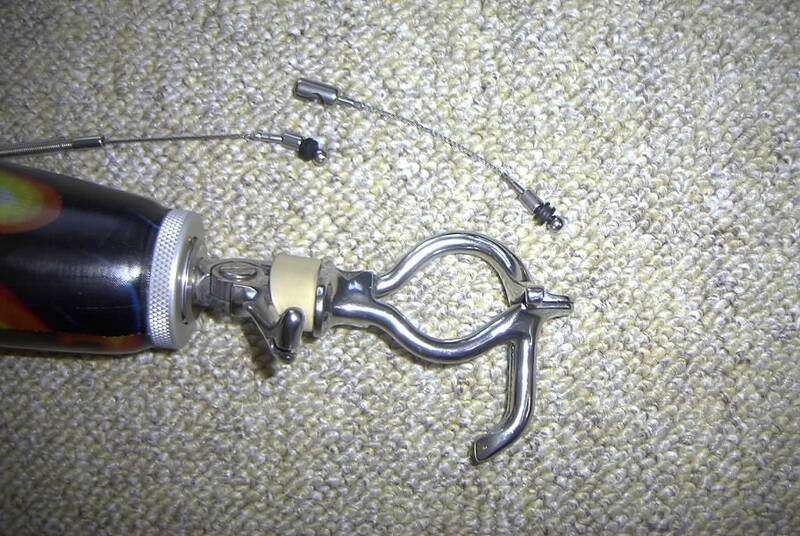 The hook-terminal I prefer is a basic working all-purpose model made by Dorrance. You can easily adjust the grip strength by adding or subtracting elastic bands. 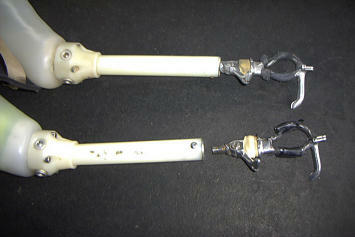 (I prefer a death-grip) The hook-terminal attaches to a "Endo-skeletal Delryn Pylon" via a standard terminal adaptor. The adaptor must be inserted with glue into the pylon then secured with screws through the pylon wall. 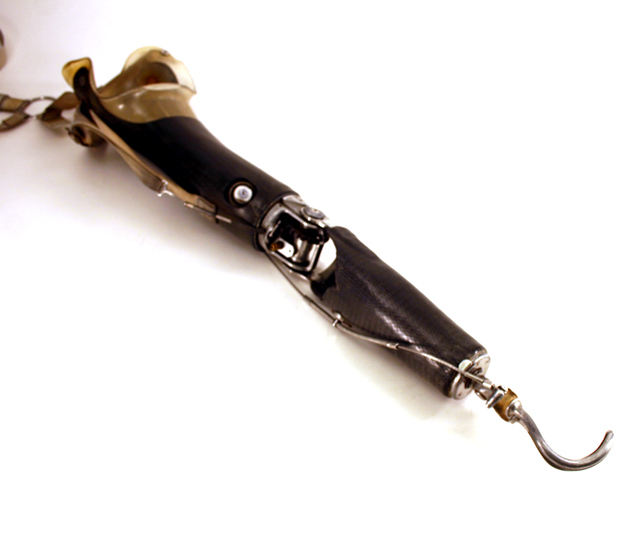 The second generation arm is a special "slip- socket" design that features two sockets, an outer & inner. 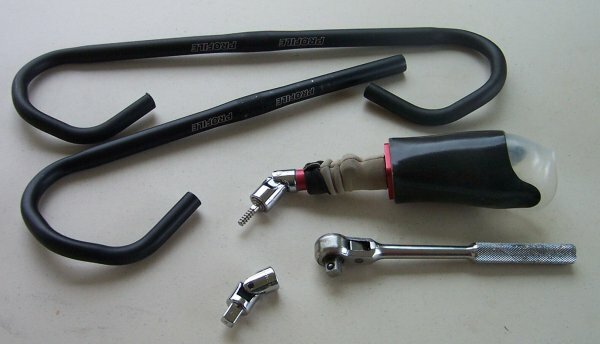 The inner socket slides up & down to a maximum of 1/2 inch. 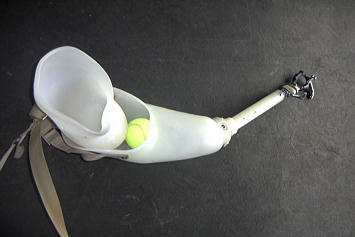 This allows for more freedom of movement as well as protection & shock absorption via a tennis ball. 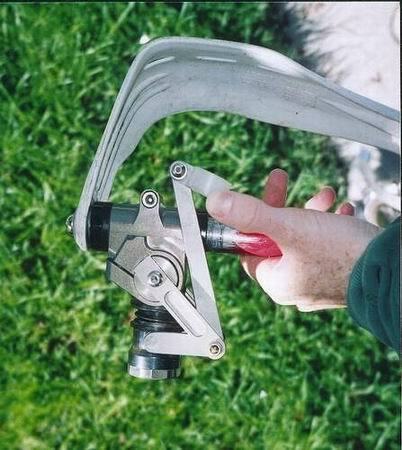 You can see by this picture how the hook-terminal clamps on to the handle bar. 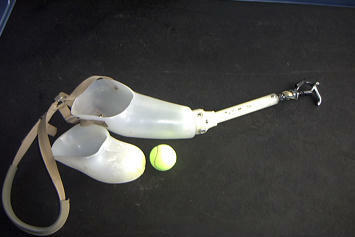 The following pictures feature a modified conventional prosthetic arm that was made by Bryan Mitchell of. 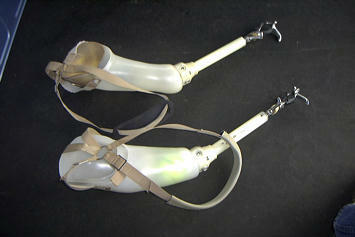 Mitchell Prosthetic & Orthotic Services Ltd. The modifications were made for both safety and comfort. 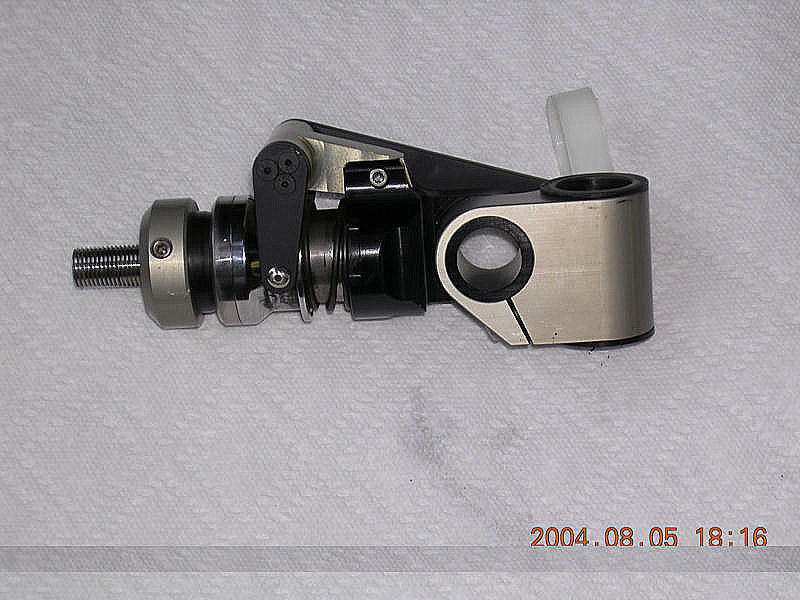 The arm features basic standard controls with only minor modifications which include a set screw at the base of the upper socket that secures the elbow turntable and prevents it from twisting or turning. 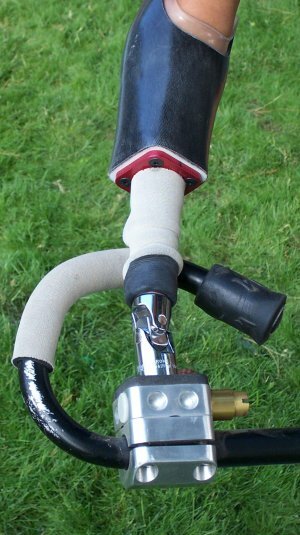 Other modifications include a cable extension which allows you to rotate the hook without adversely affecting the control harness and an elbow control lockout device which allows you to lockout the elbow by simply detaching the control cable. 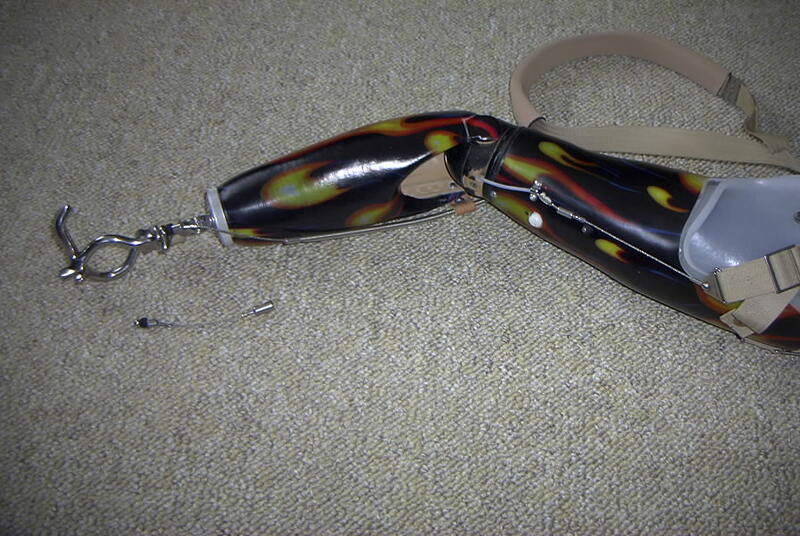 The following custom arm & hand were built and designed by William Craig who is featured on the Arm Amputees page. 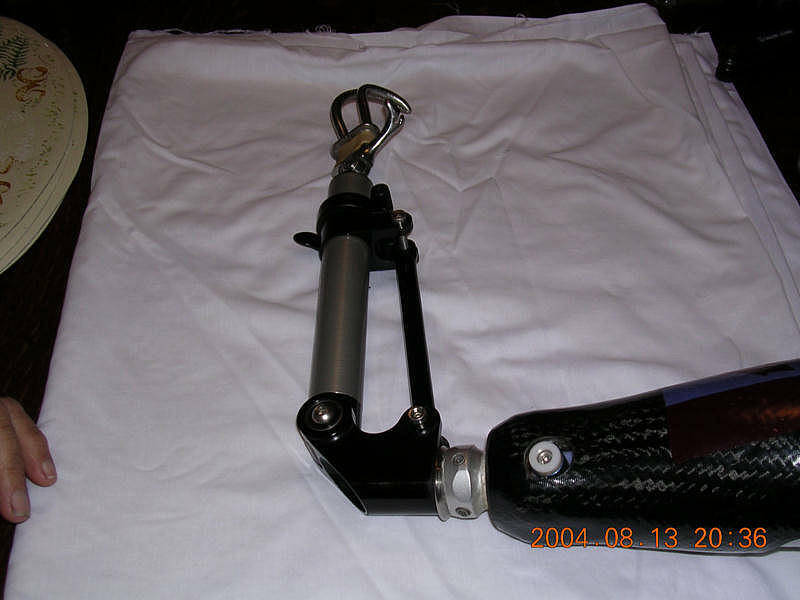 The arm features a fox racing shox and a releasable grip. The following pictures were contributed by Bruce Chatwell who is featured on the Motorcycle Amputee page and has been an above left elbow amputee for over 36years. 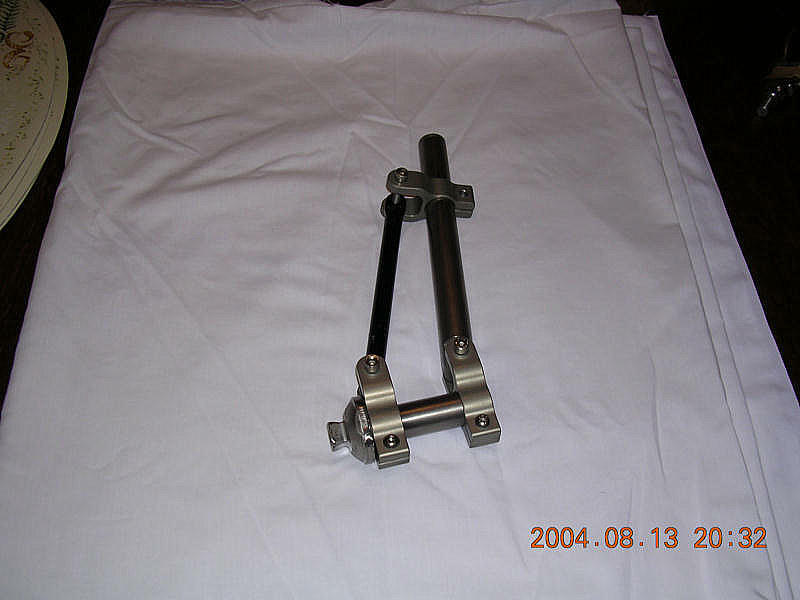 Bruce has logged thousands of miles on both his Harley Davidson motorcycle and his 600 Mountain Cat snowmobile, using the arm featured below. The following picture and information was submitted by Jeremy Gordon. 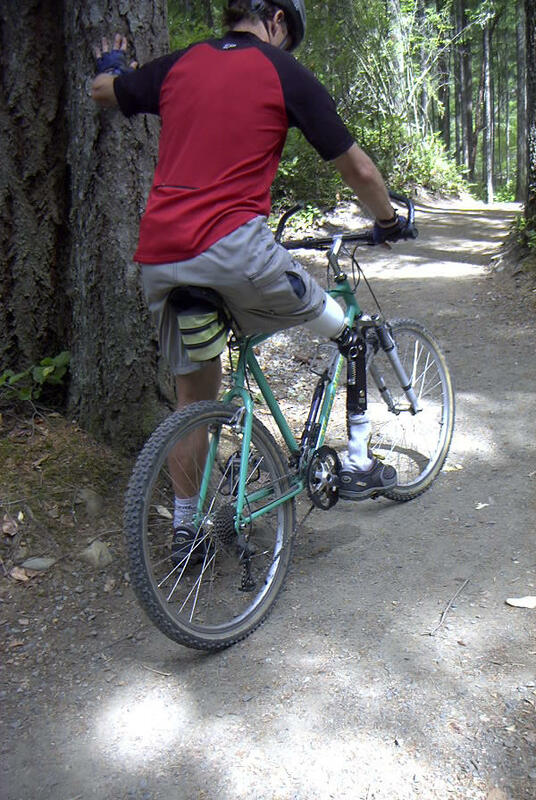 HI, I'm a one armed mtb biker and I use a PVC cup puttied onto a bar end and just put my stump in the cup (I'm below right elbow) . I've attached pictures of the set up I've got on my flat bar roadie. Stay tuned for more pictures and information. 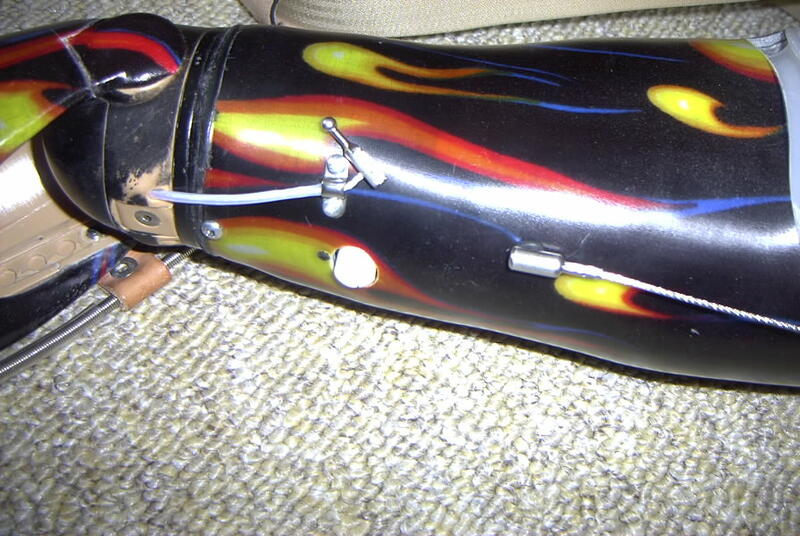 The following photos were contributed by Dax Jaikel, a below right knee amputee featured on the Leg Amputees page. 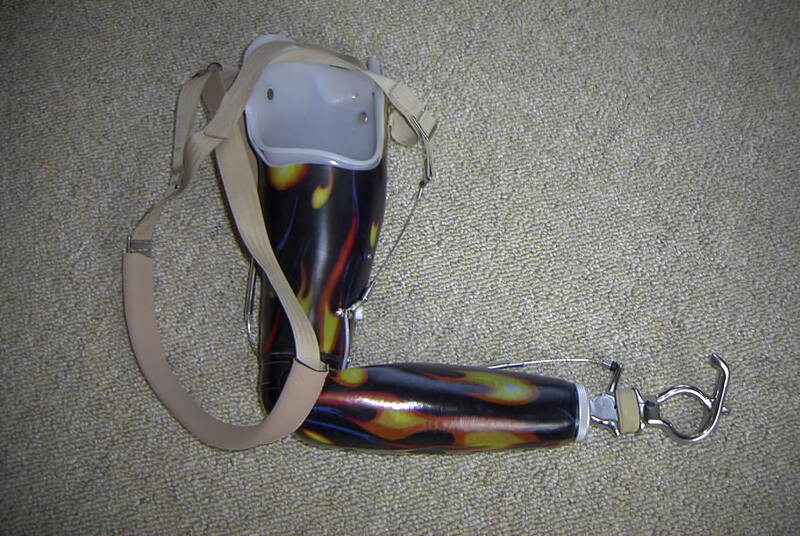 The following photos were contributed by Jan Barlage, an above right knee amputee featured on the Leg Amputees page. 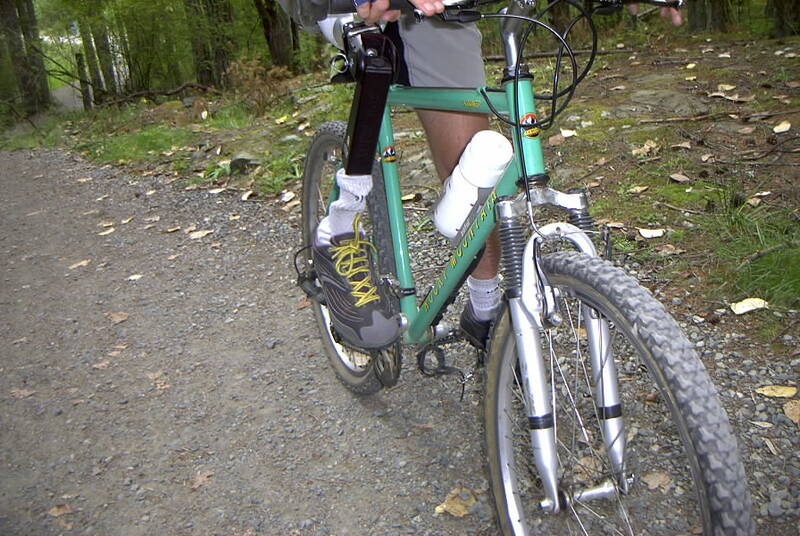 Jan developed this leg along with a special device to assist above knee amputees while riding down stairs and steeps. The following photos were contributed by Steve Middleton who is featured on the Leg Amputee page. 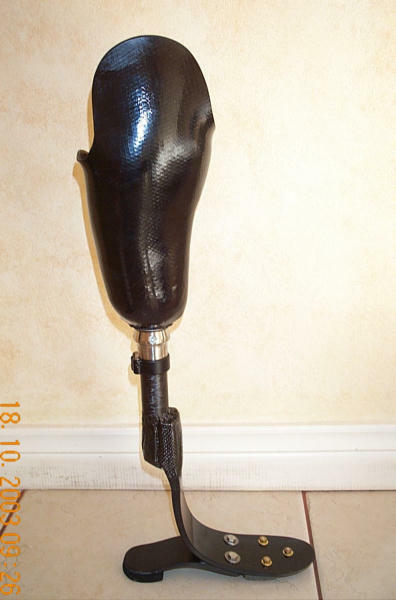 The leg features components by Aulie Prosthetic Devices ( aaulie@coinet.com ) that are light weight, water proof, and relatively inexpensive. 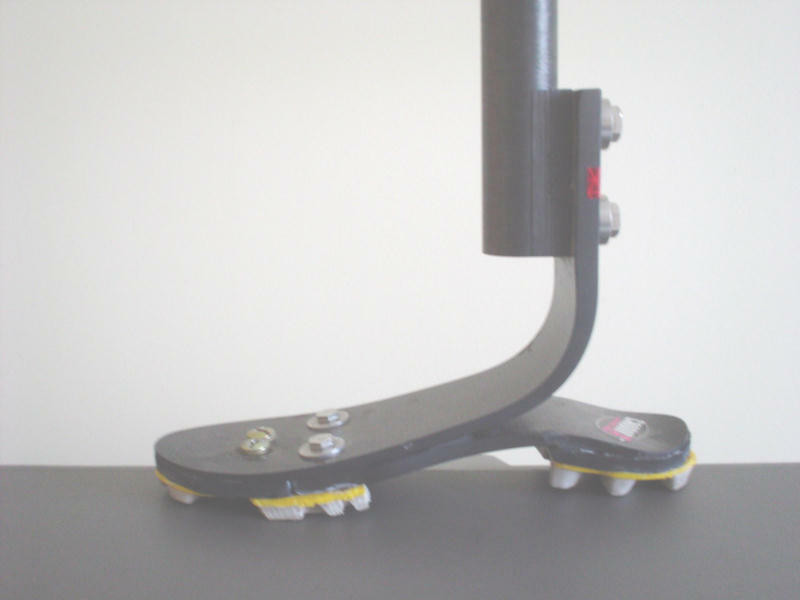 The leg also offers a wide range of movement for pedalling. 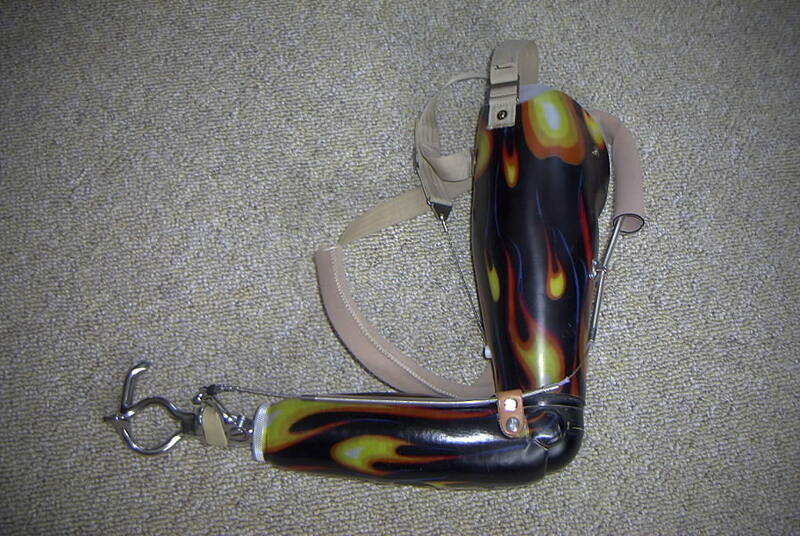 You can email Steve at: saam@shaw.ca or check out his website at: http://morethanmobility.ca/ for more information on Steve's leg and knee components.